One of my favourite foods aside from Chinese is Mexican. It’s so quick and easy to cook delicious and meals that are full of different flavours. Being able to sit together as a family and eat with your hands as you delve into bowls of different ingredients and help yourself to a meal how you like it is a great way to get everyone together. We often have fajitas or enchiladas at least once a week in our house. When it comes to thinking of Christmas presents for adults in my family, I can struggle. The kids are easy especially when we have a Frozen fan in the house, but I like to give gifts that will be appreciated rather than left unloved in a box until a suitable amount of time has passed before it’s passed on. Last year I created a themed gift basket for my brother and his girlfriend and it was well received. Being able to give something useful in the basket as well as food items that will travel well on the day is a great idea, and something I am expanding on this year for friends and relatives. I start my gift basket with my useful item as mentioned. In a Mexican themed gift basket I would choose to add a sizzler pan. I know that whenever we are eating out, there is a great reaction when a sizzler pan is brought out from the kitchen. The reaction would be just as well received at home and it’s a bonus to keeping the food hotter for longer at the table. Is the recipient short of ideas in the kitchen? Perhaps adding an inspiring recipe book to your gift basket. I like discovering new ways of cooking recipes and learning which different ingredients can be added to tweak the flavours. If your recipient likes to wear aprons, I spotted a great apron to fit the Mexican theme that would suit any fajita loving chef. Once you have your basic gifts included in the gift basket, it’s time to add the fillers. For a Mexican themed gift basket, there are plenty of options you can add to the basket that won’t spoil between wrapping and opening on Christmas Day such as fajita spices, tortilla wraps, salsa mixes and bottled sauces such as guacamole. For the perishable items such as the meat and vegetables you could add in a supermarket gift voucher depending on your budget for the recipient to purchase some meat and vegetables and sides for their Mexican feast. Have you ever give or received a themed gift basket? What would you include in yours? 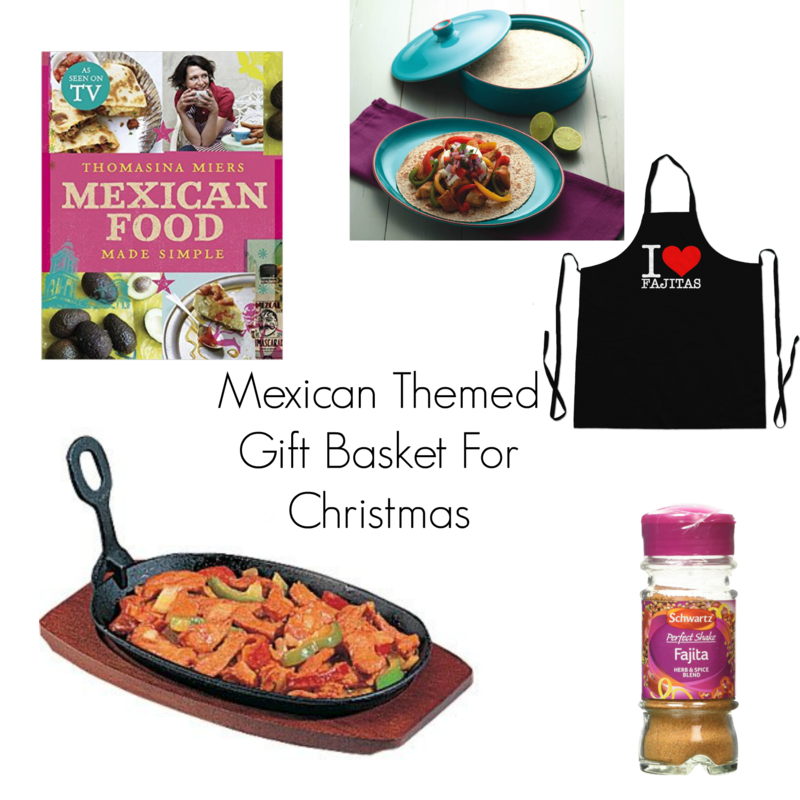 I’ve never received a themed basket but a Mexican one would be well received – we love Mexican food and a goodie hamper would ensure we planned a good Mexican night in one weekend! What a great choice. I’m not into Mexican food but I’m very interested to get myself a Mexican cookbook. I’m surprised you haven’t experimented in Mexican cooking yet.